Airvoice Wireless Review - From $3.33 per Mo. Airvoice Wireless is a relatively small prepaid provider with prepaid rates from $3.33 per month and unlimited plans from $30 per month on AT&T 3G network. 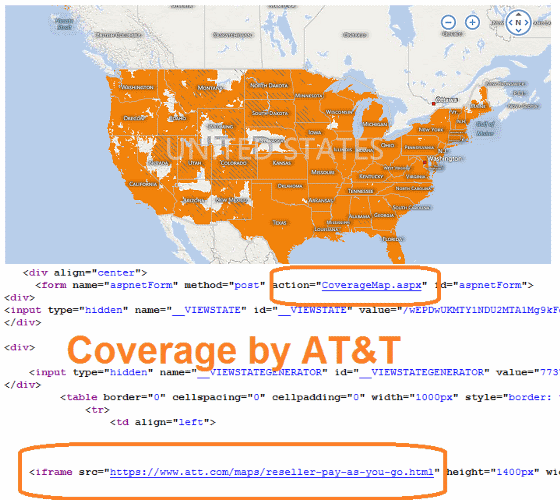 The coverage map on their site doesn't list who provides the coverage, but if you look at the page source of the map, you can see that coverage is provided by AT&T. In particular, it is the same coverage as that provided for AT&T Gophones. They also used to offer CDMA phones that must have run on Sprint's or Verizon's network, but it appears that they no longer do that. Airvoice sells its physical phones at retail locations of licensed dealers. So, if you can find a store selling Airvoice phones in your area, then you are in their coverage area. You can now purchase their phones and airtime online. They offer a good selection of phones. All the phones listed (as of 2011) are under $100, so they're affordable. The selection ranges from a refurbished Samsung Epix Smartphone for $99 down to a basic Alcatel E206 candy-bar style phone for $25. If you already have an unlocked GSM phone, you can purchase a SIM card. A standard SIM card costs $4.99, and the micro and nano versions cost $5.99 and $6.99 respectively. You stick it into your unlocked GSM phone and activate it. The SIM cards are mailed via standard USPS mail, so it takes a few days to arrive. The rates is officially 10 cents a minute. Refills start at $10 which is good for 90 days. You get a $1 bonus for buying the $20 refill and a $2 for the $30 refill. This drops your effective per minute rate to 9.5 and 9.4 cents per minute. Text and picture messages cost 10 cents to send and receive..
Data costs 6.7 cents per MB. If you use a lot of data, that could get expensive. You can buy Airvoice Wireless airtime refills online. You pay with credit card, and your minutes are sent to your phone within one business day, though it probably won't take that long. There is a $1 monthly maintenance fee that is charged on the eighth day of the month. This effectively increases you per minute cost depending on how much you use your phone. For example, if you only want to use the $10 card for the whole 90 day period, then you would be charged a total of $3 during those 90 days, leaving you with only $7 (or 70 minutes) of airtime to actually use for calling or texting. The reason for this fee is for E911 access. There is a steep $2.65 charge for dialing 411. There are free options available such as 1-800-FREE-411 (1-800-3733-411). There are four unlimited plans costing $30, $40, $50 and $60 per month. These included unlimited talk and text and come with 500MB, 1GB, 2GB and 3GB of data. Remember, your phone will be on the 3G network. For $10 per month, you get 250 minutes which works out to 4 cents per minute, which is a pretty good compromise between the pay as you go plans and the unlimited plans. Calls to Mexico and Canada cost 2 cents per minute. Call to Canada cost about 1.9 cents the last time I checked. While it's not a well-known prepaid provider, Airvoice Wireless seems to have some good features and a good selection of affordable phones, so you might want to check them out. Here some more providers big and small. Let's start with the one that provides Airvoice with its network coverage. AT&T helped create the popularity of the prepaid phone with its GoPhone. The plan stagnated for awhile, but lately they've been trying to revive it with some options that work well with smart phones. Another plan that uses the same network is Red Pocket Mobile. The company offers SIM cards that you can use with unlocked GSM phones. They also have a small selection of phones through a couple of partner sites. If you prefer the T-Mobile network, and you have an unlocked phone, then you could try Simple Mobile instead. Their unlimited plans start at $40 per month which include varying amounts of data at 4G speed.